So do I! Don't tell everyone - let's keep it exclusive. Too late... you’ve moved there. 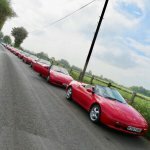 Will let you know when I drive the Elan there! Hey, nice to know that we are a few in Spain. We should try one day to coordinate! I've just realised I sent an interface to AllanB about 10 years ago and he's just up the road. I've sent him an e-mail as he hasn't been on the forum since July. did the highway double yellow marking machine go by while parked by any chance ?